DELUXE PICTURE DISC VINYL EDITION!!! Witchfinder General are a doom metal band from Stourbridge, England. They were part of the New Wave of British Heavy Metal scene and have been cited as a major influence on the doom metal genre. "Friends of Hell" is their second studio album originally released in 1983. Friends of Hell is better on many fronts than Death Penalty. The vocals are better, the drumming is better, and the production is overall much cleaner. So why not 5 stars? The songs just aren't as strong as on the debut album - there are some good tunes - "Love on Smack", "Last Chance" and the title track, but nothing nearly as good as what you find on Death Penalty. There are some elements that just don't work, like the awful ballad or the ridiculously 80s sounding keyboards during the chorus of "Music" (otherwise a decent song). It does get better on repeated listens, so there is definitely reason to give Friends of Hell a chance. Definitely a Sabbath vibe on some tracks, as expected, but not terribly heavy. I enjoy this one in the car turned up loud, but if I have my choice I'd pick Death Penalty any day. Lovers of doom metal, NWOBHM or those that are into the "backstory" of modern metal will all find something to like here. If you are a fan of NWOBHM or DOOM, these guys are the masters of the genre. Hailing from the same home town as one of my other favorite NWOBHM bands Diamondhead. This album and "Death Penalty" are a must have. Some of my favorite tracks are "Music", "Love On Smack", and "Shadowed Images". Phil Cope guitar playing is brilliant and Zeeb Parkes vocals are phenomenal. My only regret is that Zeeb left the band long before I had heard of them or would have a chance to see them perform live. I just wish there were more songs from this lineup of the band, I would buy the music in a heart beat. To Phil and Zeeb thank you for giving the gift of your music to rest of us. Is this the best album ever? No but it is a good album to sit back and listen to. Way too often people say things like "this is unoriginal" or "they ripped off Black Sabbath". I would call those people snobs and never talk to them again. If you're in to metal you'll like this. Why get rapped up with analyzing the music when you can just enjoy it? By 1983, the New Wave of British Heavy Metal had largely died out, with several key bands having gone in a more commercial direction or otherwise fallen short of the creative drive that characterized their earliest releases. Coventry's Witchfinder General were somewhat late-coming to the scene, having issued their debut LP in 1982. "Death Penalty" was a very solid affair of Sabbath-inspired doom but was held back by having only a couple real standout numbers, along with a barely passable production. On 1983's "Friends of Hell," it was clear the band had improved in all possible areas -- production, song structures and overall musical maturity. 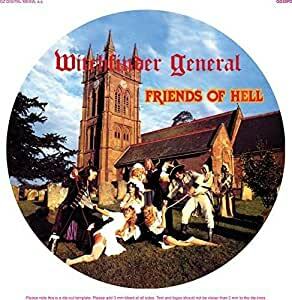 Whereas before the lyrics focused on burning witches and other assorted nasty imagery (with infamous sleeve art to back it up), "Friends of Hell" is a more serious and consistent album and overall a big step forward. I could find no fault with most of the album. From the first track "Love on Smack," the sound quality is clear as a bell, including the bass, which was largely buried on the debut. The Sabbath-inspired riffing remains on this and the very catchy song to follow, "Last Chance." The ultimate classic though has to be track number three, "Music," which is an ode to a love for rock & roll that any music lover will readily identify with. Thanks, guys, for putting to words and to music something I've always felt but had never been able to adequately express. Side two is the more introspective and doomy side, complete with takes on recurring disillusionment and loneliness in "Shadowed Images." Appropriately, the album closes with a great bass interlude that couldn't have been heard properly had it appeared on the debut. Both of the Witchfinder CD reissues on the U.K.'s Heavy Metal Records are choice, coming in beautiful cardboard slipcases that are the next best thing to owning the original LP. The CDs themselves are even made to look like mini vinyl records. All in all, one of the last great NWOBHM releases and just an all around quality metal album. Highly recommended. People who don't know this band are missing out. Not as good as "Death Penalty," though.